A slight mismatch between the hexagonal structures of molybdenum disulfide and tungsten diselenide creates a strain that can be released by the formation of a “5|7 dislocation,” in which two hexagons collapse to form a pentagon and a heptagon. Reactions with molybdenum disulfide in the environment cause the dislocation to move deeper into the tungsten diselenide, drawing a nanowire of molybdenum disulfide behind it. “Two-dimensional materials” — materials deposited in layers that are only a few atoms thick — are promising for both high-performance electronics and flexible, transparent electronics that could be layered onto physical surfaces to make computing ubiquitous. 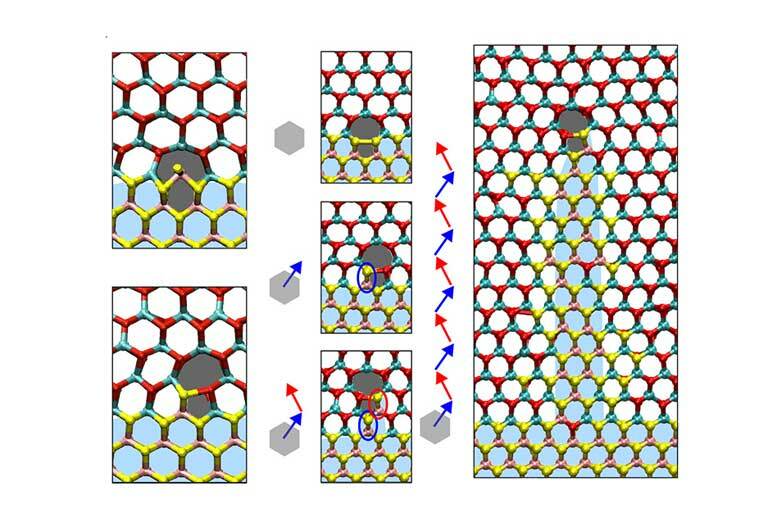 The best-known 2-D material is graphene, which is a form of carbon, but recently researchers have been investigating other 2-D materials, such as molybdenum disulfide, which have their own, distinct advantages. Producing useful electronics, however, requires integrating multiple 2-D materials in the same plane, which is a tough challenge. In 2015, researchers at King Abdullah University in Saudi Arabia developed a technique for depositing molybdenum disulfide (MoS2) next to tungsten diselenide (WSe2), with a very clean junction between the two materials. With a variation of the technique, researchers at Cornell University then found that they could induce long, straight wires of MoS2 — only a few atoms in diameter— to extend into the WSe2, while preserving the clean junction. The researchers contacted Markus Buehler, the McAfee Professor of Engineering in MIT’s Department of Civil and Environmental Engineering, who specializes in atomic-level models of crack propagation, to see if his group could help explain this strange phenomenon. In the latest issue of Nature Materials, the King Abdullah, Cornell, and MIT researchers team with colleagues at Academia Sinica, the Taiwanese national research academy, and Texas Tech University to describe both the material deposition method and the mechanism underlying the formation of the MoS2 nanowires, which the MIT researchers were able to model computationally. The ability to create long, thin MoS2 channels in WSe2 could have a number of applications, the researchers say. But the theoretical explanation of the molecular mechanism underlying the nanowires’ formation also raises the hope that their formation could be controlled, to enable the assembly of atom-scale electronic components. In a 2-D crystal, both MoS2 and WSe2 naturally arrange themselves into hexagons in which the constituent elements — molybdenum and sulfur or tungsten and selenium — alternate. Together, these hexagons produce a honeycomb pattern. The Cornell researchers’ fabrication technique preserves this honeycomb pattern across the junction between materials, a rare feat and one that’s very useful for electronics applications. Their technique uses chemical vapor deposition, in which a substrate — in this case, sapphire — is exposed to gases carrying chemicals that react to produce the desired materials. The natural sizes of the MoS2 and WSe2 hexagons are slightly different, however, so their integration puts a strain on both crystals, particularly near their junction. If a pair of WSe2hexagons right at the MoS2 junction convert into a hexagon matched with a heptagon (a seven-sided polygon), it releases the strain. This so-called 5|7 dislocation creates a site at which an MoS2 particle can attach itself. The resulting reaction inserts a molybdenum atom into the pentagon, producing a hexagon, and breaks the heptagon open. Sulfur atoms then attach to the heptagon to form another 5|7 dislocation. As this process repeats, the 5|7 dislocation moves deeper into WSe2 territory, with a nanowire extending behind it. The pattern in which the strain on the mismatched hexagons relaxes and recurs ensures that the dislocation progresses along a straight line. The research was supported by the Office of Naval Research and the Department of Defense. Be the first to comment on "New MoS2 Nanowires Could Point Toward Future Electronics, Solar Cells"